This week we got to see the first public Project Viewer for the Materials System. I’ve added a link in the left column. It is a dynamic link so it should always point to the latest version. The current version is: Second Life 3.5.1 (273518) Project Materials. Download size is just under 30mb. It installs to its own directory and has its own settings files. It does however, share chat logs and the cache. I suggest you change the cache to use a location other than the main viewer’s cache. You can go into Preferences->Advanced->Cache Location and change it. Then restart the viewer. While you are on the panel, set your cache size to match the cache size of any other viewers that use the same cache location. I also suggest you open Preferences->Settings and set the Maximum Bandwidth. Until the Sunshine Project is completed the max value is about 1,800. Most third party viewer developers use a setting of 1,500. Also remember to set your Preferences->Move & View so the mouse-steering works as you want. Otherwise you’ll be single clicking to navigate. This version of the viewer has the CHUI. This viewer also reminds you to update your video driver. I have the newest nVidia driver (314.22) and the viewer still suggests I do not have the latest driver. There are known problems with this viewer. So, read the Release Notes in the wiki. The build panel is pretty much the same until you get to the texture tab. Then there are significant changes. 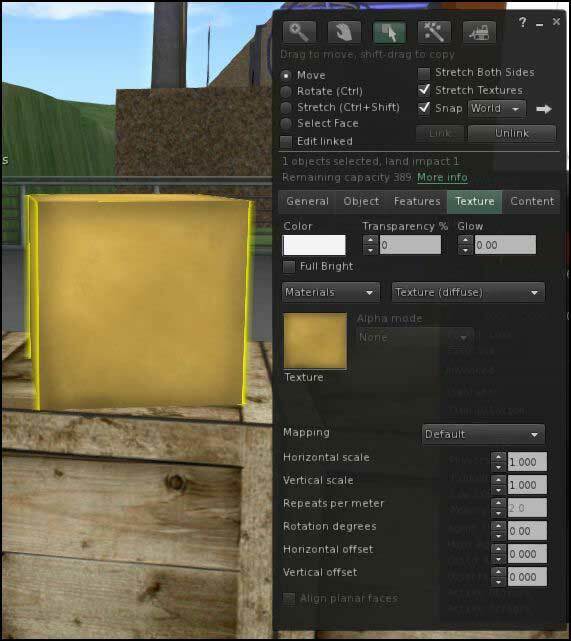 This image shows a cube textured with a cardboard box texture. 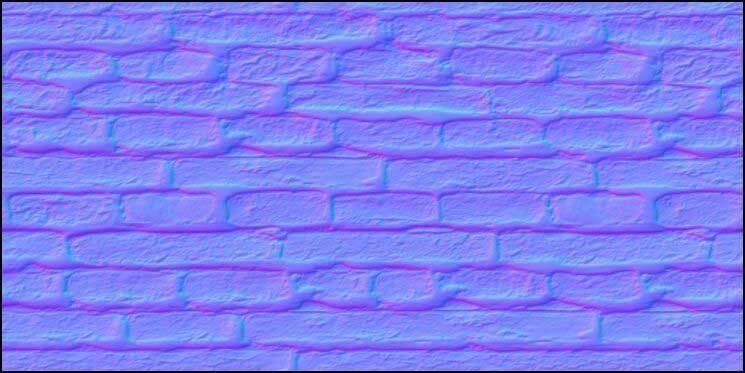 This is the style of texture we have used for the past several years. The previous bumpy and shiny are still included. In Bumpiness is a new choice “Use Texture.” The texture you need is a normal map. The nVidia drivers have a plug-in for Photoshop to help make normal maps. There are some textures provided with Normal and Specular Maps. You will find that in this version of the viewer the various faces of the object may look different. Rotate the objects to be sure it is not a lighting issue. Older viewers or viewers with deferred rendering (Advanced Lighting Model – previously Lighting & Shadows) disabled cannot see the new bump and specular map effects. We may see some Third Party Viewers releasing project viewers for Materials. But, I suspect most will delay a release until the Lab stabilizes their code. I think this feature is going to greatly change the appearance of Second Life. I did check it out. I am getting a feed update about 90 minutes after the article posts. FWIW, I get regular updates from your feed. Would be really nice if the alphamasking features could be seen without Advanced Lighting Model enabled. No point in using it otherwise. They’ll just see the texture with no transparency at all. I doubt that is going t o happen. If it does, it is a ways off. The best information I’ve gotten is over 50% of SL users have computers capable of deferred rendering, which seems low for a feature that is so heavily used in gaming.